Dan has spent the past five years as Vice President Development for The Nine Network of Public Media. During his tenor Nine Network achieved record breaking fundraising results. The Nine Network just completed a $25 million dollar capacity building campaign. FY2014 achieved the best fundraising year in their 60 year history. Dan has spent the past eight years as the Vice President of Development & Communications for Catholic Charities of Saint Louis. Under Mr. Shasserre’s direction, Catholic Charities exceeded annual fundraising goals each year. Dan’s reputation for creating innovative strategies led to record-breaking revenues in major gifts and planned gifts. Dan is an experienced marketing professional. He designed and implemented brand awareness benchmark studies and directed tactics, leading to a 40% increase in brand awareness of Catholic Charities in the five year period measured. The Catholic Charities of Saint Louis Federation of agencies fundraising revenue exceeds $25 million annually. They are considered to be the most successful fundraising organization of all Catholic Charities social service agencies nationally. In addition to local fundraising, Catholic Charities of Saint Louis raised more than $5 million to aid victims of 9/11, survivors of the tsunami in Southeast Asia, and people who faced the devastating destruction of hurricane Katrina. Prior to joining Catholic Charities, Dan spent ten years in the professional sports marketing field. He served as the Director of Marketing for the National Hockey League St. Louis Blues franchise. In that capacity, he had the opportunity to put together hundreds of corporately sponsored special events. Later, he spent seven years as Vice President for a St. Louis-based advertising agency working on branding strategies and media plans for clients like Anheuser-Busch, John Deere, Ralston Purina and Lennox Industries. Mr. Shasserre has previously served as a consultant for international organizations. He has been a strategic planning and marketing training facilitator and a frequent guest speaker at regional and national conferences. He has spoken recently at Catholic Charities USA national meetings on topics like "How to Build Your Brand" ; "How to Create a Planned Giving Program on a Small Budget" ; "Branding , Marketing, and Fundraising-Why it All Matters." Dan and his wife Sandy have been happily married for forty-seven years. They have six children and ten grandchildren. Fifty-years is a long, long time to be married. Sandy and I are fortunate. We actually love each other after all these years. We have loved each other as 21 year-old newlyweds. We loved each other when we had four children under the age of five. We loved each other when we had six children in private Catholic schools and colleges that we couldn’t afford. We loved each other when we had no money, when we had no jobs, when we borrowed to make the house payments. We loved each other through our more successful years. And, we still love each other even after spending 12,600 miles in a car together as we traveled the country for 5 1/2 months. A happy marriage, it seems to me, is like a long ride on the road—there is a steady rhythm and harmony of being on the road together. We know that storms and bumps will come and go. Yet, we have a calm confidence knowing we are in this together until the journey ends. When we stop on the journey to look backward or forward we see beauty and wonderment. This trip is a lot like our life together. We are forever grateful because Wherever we look we see far more roses than thorns. When I was a young man early in my work career, I expressed no desire to retire. I loved my work (most of the time). When I got to this age I wanted enough money saved that we could afford to retire even if I had no specific intention. Now that I am age 72 and have no wages coming in from employment I have found a way to vacation for nearly six months in very nice accommodations at an affordable price. How did we do that? Here is the secret. You have to have really good friends and family who live in nice places like Blue Hill, Maine, Las Vegas, Nevada, San Diego, San Marcos, Dana Point,Santa Cruz, Santa Rosa, California, Portland, Oregon, Seattle and Anacortes, Washington. It also helps to have a son-in-law who owns an island resort and he chooses to put you up for free. So, bottom line, I guess we can afford to retire under these very favorable conditions. Thanks to friends and family who made this journey possible. Sandy and I have traveled to all 50 states and on this trip we have spent considerable time in many. We never tire of seeing this beautiful country. Places we recently visited like Schoodic Point or Acadia in Maine, Flagstaff, Arizona, the Grand Canyon area, San Diego, Dana Point, Santa Cruz, Santa Rosa, California, the Redwoods, the Oregon coast on Highway 101, Orca Island, Guemes Island, Ellenburgh, Washington, Mazama and Winthrop, Washington, Wenatchee National Forest, Chuckanut Highway to the Fairhaven District of Bellingham, Washington, Mount Baker, Washington, Mount Hood, Oregon, the drive through Oregon, Idaho, Utah and Colorado could be revisited without ever tiring of the beauty. God created a beautiful world. Enjoy it. The past six months has been spent in self-indulgence. 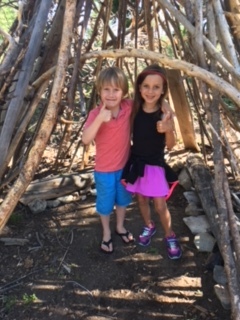 We moved from one beautiful setting with luxury living to the next acknowledging our good fortune, being grateful at times, but for the most part just living it up like we deserved it. On occasion people who struggle entered my consciousness, family, friends and acquaintances who have significant challenges occupied my thoughts for the day. My daily readings or dreaming’s forced me to remember my life is not over. My thoughts reminded me, there is still time to contribute. Easy street is not panacea. Challenges lead to greater satisfaction. One of my daily reading posed this question– “Life’s most persistent and urgent question is, what are you doing for others?”Martin Luther King, Jr.
5. So, now we are settled back in Saint Louis and begin to regain our routine. Sandy is working out at the YWCA three mornings every week. She then volunteers at the Daughter of Charity food and clothing distribution center in North County. And, she returned to daily Mass at Saint Mary;s Chapel. I am finding a routine–Golf once or twice per week with Tom and Gerry. Mass at St. Mary’s with Sandy a few times per week. Occasionally, I have a meeting for the YouthBridge Board commitment, for NIFTY, or for Camp Jump Start. I haven’t decided how much I will work for the remainder of this year. But, I have not retired. 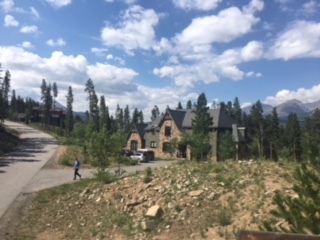 6, The family gathering in Breckenridge, Colorado was such a wonderful thing. It was so great to see the family inter-action, friendly comrade, warn embraces, genuine love for each other. It was so entertaining to watch how the younger kids played together and how the older teens showed patience and chipped in to help parents. We had five days together but it leaves us with a lifetime of fond memories and photo’s galore. Thanks to all for making this happen. 7. There is one significant thing that Sandy and I have learned these past six months of travel is — no matter where you live or no matter where you are traveling, your daily thoughts are always about the well-being of your family and friends. We miss them when we are on the road. We can’t get enough of them when we are part of their daily lives. We will always miss those that we can’t see daily or those that we don’t talk to for weeks or for months. But they remain in our thoughts and prayers. We love them all. Sunday July 8 is SashBash week!!! 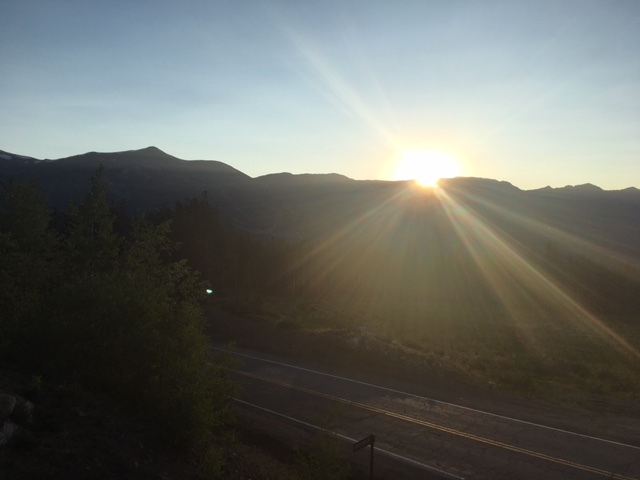 July 7–all 24 of us are in route to Breckenridge, Colorado. Sunday, we have an 8-bedroom house waiting for the Shasserre family onslaught. Craig, Nicole, Olivia, Evan, Ella have flown into Denver Saturday night and they are spending the night with Johnny O. an old soccer buddy of Craig’s. Brian, Emily, Fisher and Amaya have flown in from Sea ttle. They are spending the night in Denver with friends. Mark, Kelly, Rumi and Teo flew in Thursday and they have been with friends everyday since. Todd, Jessica, and Scarlett arrive in Denver late Saturday night. Kris, Kerry, Sienna and Sebastian are traveling from Mount Vernon, Washington by vintage VW van. They blew a tire on the way. So, they are camping near Salt Lake City Saturday night. They will have a long drive on Sunday. 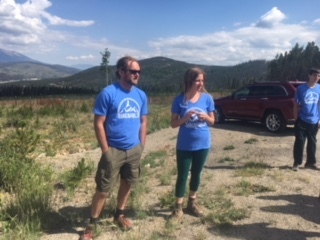 Brent and Dani left from Saint Louis today and they are driving a Subaru all the way without an overnight stop. We drove from Salt Lake City to Grand Junction, Colorado today. It’s been a wonderful day of R&R. We are happy to be spending the night in a nice Clarion. We had a brief swim and a pizza dinne r.
Olivia turned age 20 the day we all arrived at Breckenridge. Craig, Kris and Sienna have birthdays in July. So, we had continuous days to celebrate. The home cooked dinners for 24 went along flawlessly thanks to great cooks and great planning by all. 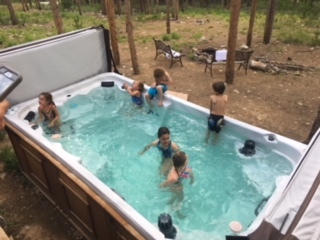 The house was magnificent….8 bedrooms, 11 bathrooms, huge 12 person hot tub, downstairs rec room included pool table, video games, shuffle board, foos-ball, and a theater room (great for watching the World Cup games). Each morning certain people left the house for hiking destinations, shopping, or whatever. 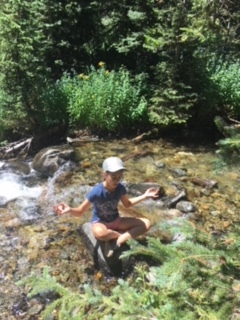 Some groups went to Vail, Colorado and some did not. Some did the eight mile hikes and some (like me) did the three miles hike. We all stayed active in family groups but still had space for ourselves. This was such a special SashBash. Special because this week in Colorado was the last week of our 22 week journey. Special because our time with family was the first time everyone could be together in one place in the past 10 years. It was special, of course, because Sandy and I were celebrating 50 years of marriage and all of the kids made a comm itment to be together. Remember the game called Roses and Thorns? One night as I was quietly observing all of the wonderful personalities that make up this large family of twenty-four I thought to myself, our “Roses” are those who have come into the family one by one, i.e., Nicole, Emily, Jessica, Mark, Kris, and Dani. They have joined our children and created grandchildren that make this very large family such a blessing. Sandy and I are so grateful. To our children and their spouses and significant others. And to our grandchildren. Thanks for being special people. Thanks for loving each other. Thanks for making Sashbash 2018 the best one ever! Crank up the Willie Nelson music…we are “On the Road Again.” Sunday morning July 1st, we skip Mary Anne’s Kitchen and drive right past Dad’s Diner, heading out of town on Commercial Ave. We drove around the round-about and stopped at the Bakery to get breakfast and coffee before heading east on Highway 20. We took Best Road to Highway 5. South on 5 toward Seattle. In a few hours we have crossed over Washington to Oregon. As we are approaching Hood River I noticed the mileage meter was about to turn over 10,000 miles traveled. I pull over at a campgrounds at exactly 10,000 miles to get a photo. Out of no where a park volunteer pulls up behind us and offers to take this photo. Sunday afternoon we roamed around Hood River for a few hours and had lunch. 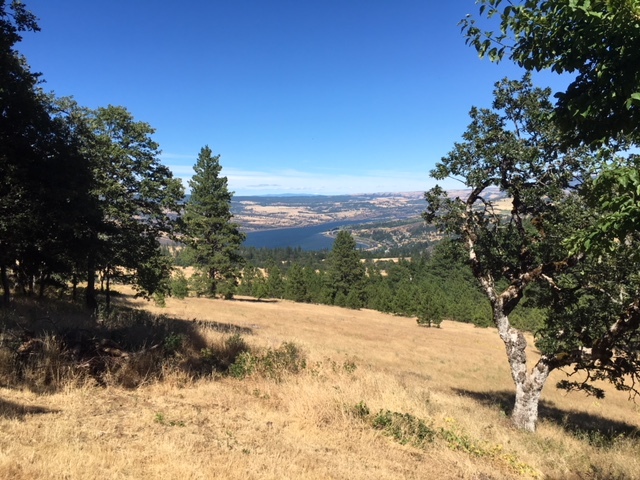 Then, we drove five miles to find our new AirBnb in Mosier, Oregon. I won’t give you all of the concise directions but suffice to say this was another adventure. Mosier has 430 people, one grocery store that closes at 5pm on Sunday. We showed up at 5:15pm. It has one restaurant. Vegetarians would like this place. It has few options for meat eaters. They will put some sausage on your pizza, if requested. I did request but they forgot. By the time I got to eat my pizza to go I noticed the mistake. So, I ate radish and cheese pizza. Then, we drove up the mountain for three miles. At the Rattlers Ridge drop off Sandy got nervous. When we arrived this place was better than advertised. We had a big two bedroom downstairs apartment with a fully equipped kitchen. They had a 46 inch TV so we enjoyed watching a movie Sunday night and a World Cup soccer match Monday morning. Brazil ousted Mexico. 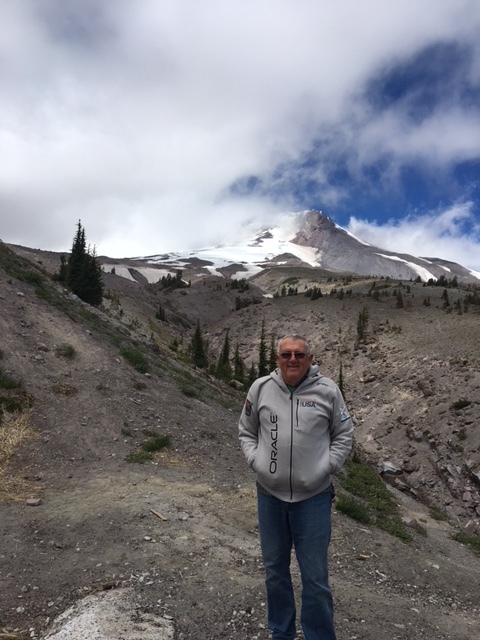 Monday, July 2, we drove all around the Mount Hood area including a stop at the Timberline Lodge. Wow! This place was built in 1929 as part of Franklin D. Roosevelt’s New Deal. To our surprise, people were still snow skiing and snow boarding on Mount Hood. The temperature at 6000 feet was 40 degrees. The temp up higher on the Mountain was much colder. 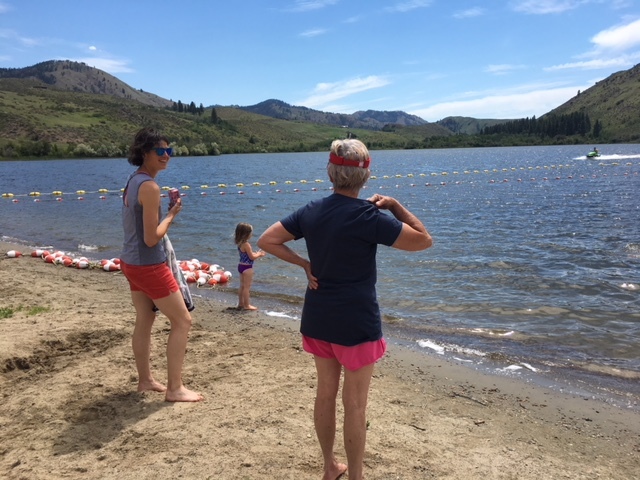 By the time we got back to Hood River the temperatures were in the 60’s and we watched wind surfers and wind boarders challenge the Columbia River in their wet suits and other gear. 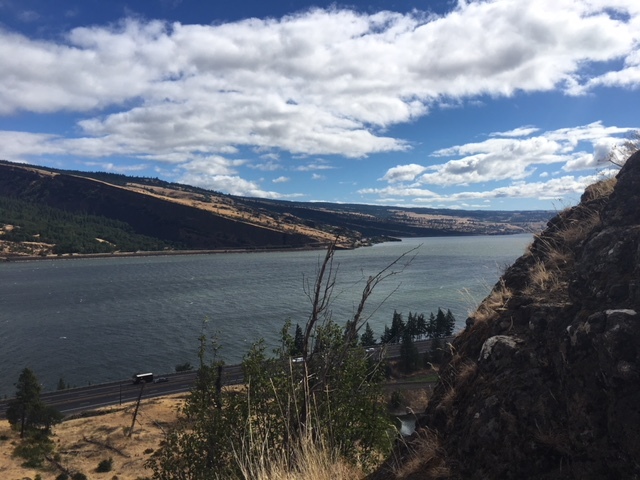 July 3 we started the journey on a long drive along the Columbia River Gorge. 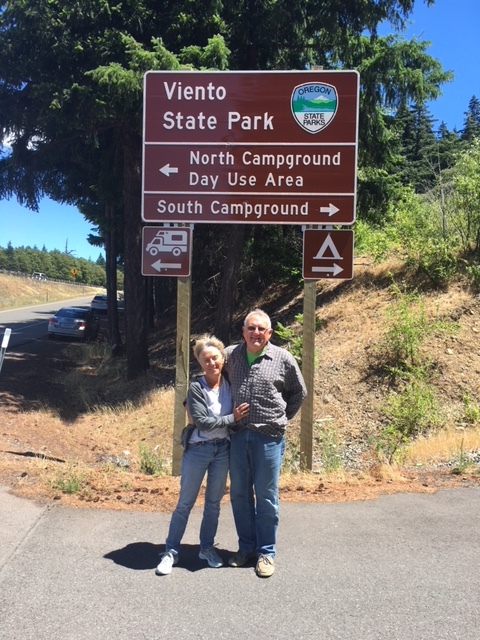 We spent the day driving to Enterprise and Joseph, Oregon where we had intended to stay. But, we decided to push on via the Wallowa Mountain loop at 30 miles per hour. As we made our way through the scenic Hells Canyon some of the hair pin turns were at 15 miles per hour. There are no rails on these roads and mountain loop road #39 was the “road less traveled.” What a FUN, but tiring day. Sandy tried to book a room for the night in Enterprise Oregon via Hotwire. She ended up booking us in Enterprise, Alabama before noticing the mistake. 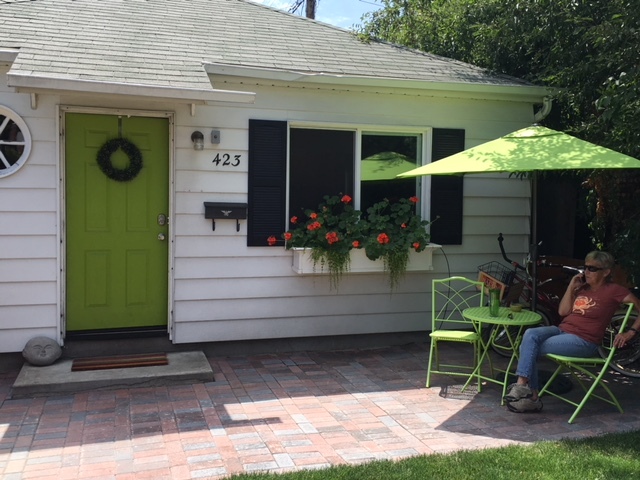 Then, she found a nice one bedroom in Richmond, Oregon through AirBnb for $75. The location was not the best–looked kinda creepy. So, we drove all the way to Baker City before pulling off the road to stay. This is where we are staying for the next two nights in Boise, Idaho. This cute little Cassita is perfect for our lifestyle. It offers everything we need in the 400 sq. ft. space. Here is Sandy talking on the phone to one of her sisters. She likes to stay in touch with Saint Louis. On the 5th we drove all around Boise sight seeing. I learned this–if your GPS talking lady tells you “stay on the route” you had better do it or else she will get pissed and make you drive around in circles until you run out of gas. Temperatures today were in the 90’s in Boise, so we are slowly making the adjustment to Midwest weather. We drove from Boise, Idaho to Salt Lake City, Utah. It’s more than a 250 mile drive. I believe there are more horses and cows to see in Idaho than people. The scenery is beautiful with one large ranch, or farm, or baron land after the next mile after mile. The highlight stop was Twin Falls where the Snake River rambles through right before you get to Rattlesnake Pass. We finally arrived in Salt Lake City at 3pm just as the temperatures reached 102 degrees. Can you believe it? 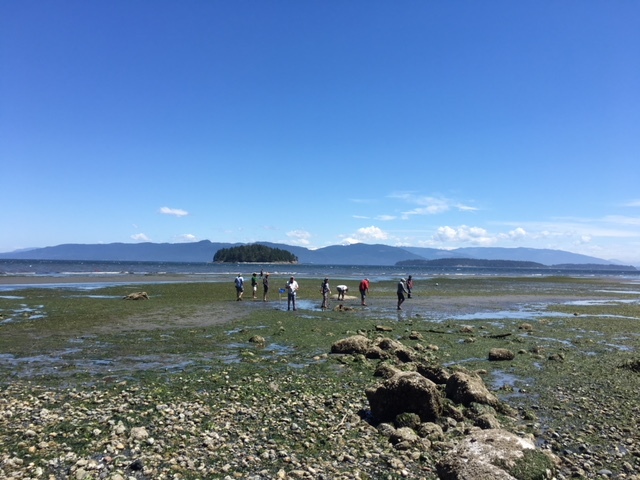 Week 20 is our final week on Guemes Island and our final week on the west coast. We begin our journey home on July 1st. In reflection, I cant believe that we have traveled by car nearly 10,000 miles, plus by air travel to Maine and the Ferry travel in Canada, plus the day-to-day Ferry travel to and from Anacortes to Guemes Island and back again day after day after day. Our thanks to Mark, Kelly, Rumi, Teo, Brian, Emily, Fisher, Amaya, Kris, Kerry, Sienna and Seba for not letting us feel like we were an intrusion on your lives, even if we were. And, thanks for all of the good times together these past 90 days. It’s been awesome! This final week I played golf with Tim and Michael, two of the three guys I met at Avalon Golf Club last month. We dropped in on Kerry and Kris and the kids for a final look at Big Mama’s farm. 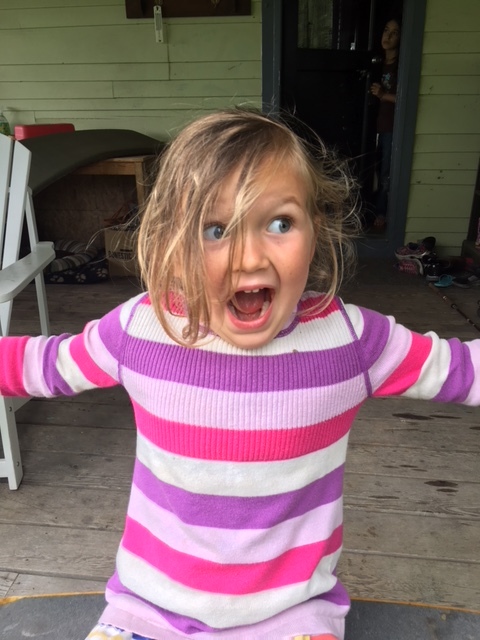 We had Amaya spend the night with us on the west shore. Friday Sandy saw Rumi and Teo’s work from their Art Class Camp. 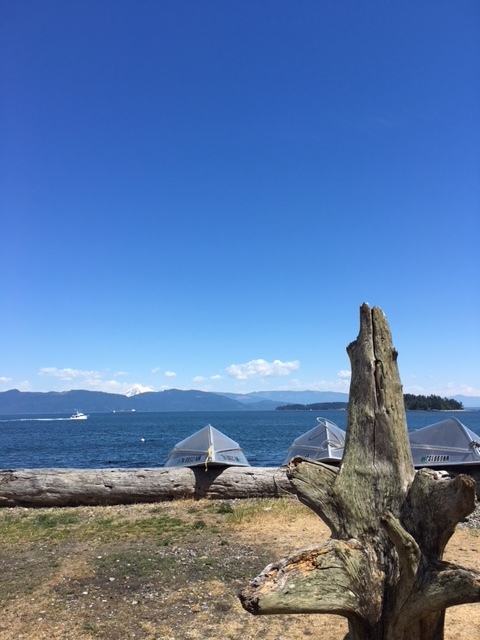 So, we are saying our goodbye’s to our beautiful view of Cypress Island. We say goodbye to the porpoise and baby seals, to the ducks and to the eagles. 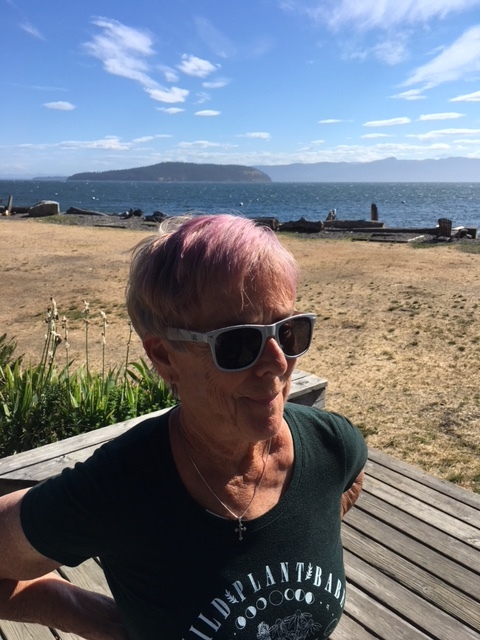 We will miss our search for the Orcas (we’ve seen two) and Sandy said she heard two from afar early this morning. We plan to travel to Hood River this Sunday and then spend an extra day to explore the Mount Hood and the Columbia River area. Then, we head further south to Bend, Oregon before heading to Idaho, then Utah, on into Colorado. Next week we will try to capture the delights of that trip on this blog as we wind down the travel days. 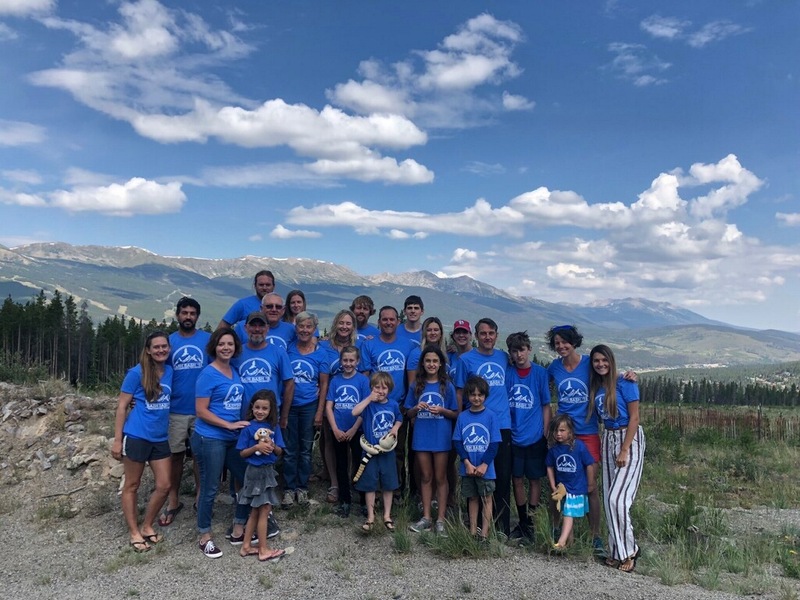 We are looking forward to seeing Craig, Nicole, Olivia, Evan, Ella, Todd, Jessica, Scarlet, Brent and Dani plus all from the West Coast as we converge for our special 50th Anniversary SashBash in Breckenridge, Colorado. Travel safely everyone. See you on a mountain top in Colorado. It’s Fathers Day! I wish I could be with my father today. He just turned 93 this past Wednesday. My dad is a good honest man who struggled throughout life to support his family by pounding nails and lifting ladders–hard work. He owned a small General Contractors business and as I have come to learn over the years running a small successful business is no easy task. He worked as a carpenter for 40 years and ran the business for more than 20 years. Congratulations Dad! Best to you. 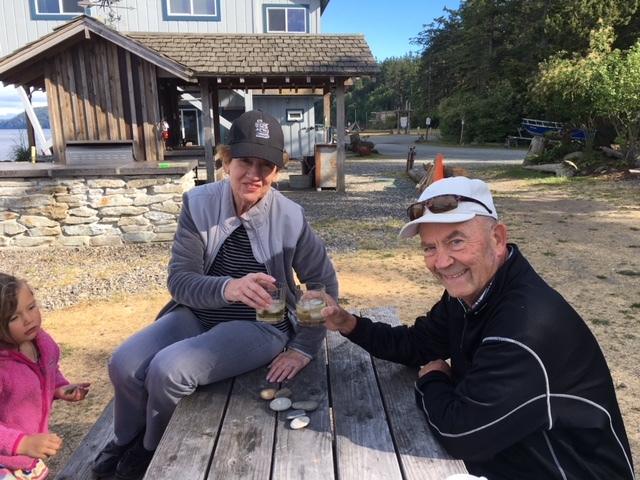 Sandy and I will enjoy Father’s Day on Guemes Island in her favorite cabin–the Baker House. We enjoyed a special breakfast prepared by Kerry and Kelly. Salmon berry (picked off the bush) pancakes, eggs, vegetarian sausage, potatoes and homemade bread. My health conscious kids splurged this morning! Brian and Amaya came across to Guemes in the afternoon so the kids could all play together. We enjoyed some homemade cobbler that Kerry had made with blueberries from last year’s crop. We put ice cream on top for a great desert. Then, everyone had to leave to make the Ferry ride back over to Anacortes where there is a more normal civilization. Monday morning started, like many mornings lately, with a cup of coffee and a beautiful view from the porch of our cabin looking east across the water and small islands to the glorious snow capped Mount Baker. Jessica came by at 1:30pm for my afternoon massage ( a Fathers Day gift from Mark and Kelly). Then, I rushed to get on the 3:15 Ferry and barely made it. 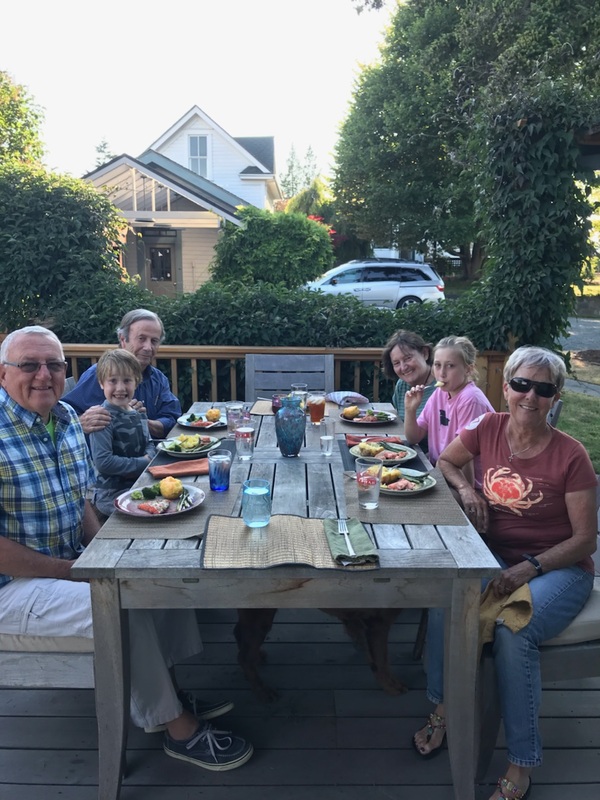 At 6pm we had a nice Salmon dinner at Kelly’s with Mark’s parents Calvin and Patty Linnemann. Teo, the seven-year old, initiated a family favorite conversation starter at dinner called name your Roses, Thorns and Blossoms of the day. Roses are the good things that happened. Thorns are the bad things. Blossoms are things you are looking forward to. 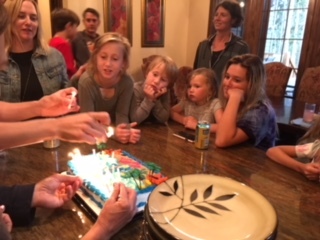 We all took part in revealing the good, bad and things to look forward to….when all was said and done it was clear that family gatherings comes first. And, we are fortunate that the Roses far outweigh the thorns. Tuesday morning we left the island and Anacortes for the three hour drive to Mazama. The drive, all on Highway 20, heads east through cities like Sedro-Woolley, Concrete, Rock Port and Marblemount. We passed through Porcupine Lake, Blue Lake, Diablo Lake and Beaver Marsh to get here. I never get tired of this beautiful drive and the cabin in the woods destination. Wednesday we spent the day with Emily and Amaya at Pearrygin Lake near Winthrop. This was our first day in Washington with temperatures near 90 degrees. The cool lake water felt chilled but perfect for such a day. Thursday we returned to Mount Vernon to spend a few days with Kerry and the kids at Big Mama’s Farm. I hopped on the tractor to cut the grass again and Sandy and Kerry did the heavy labor moving dirt and mulch on a new garden. 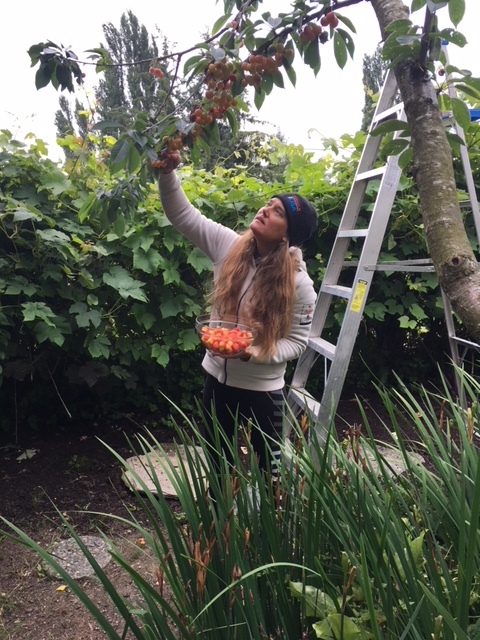 Kerry and the family have blueberries, cherries, raspberries, strawberries, tomatoes and watermelon. 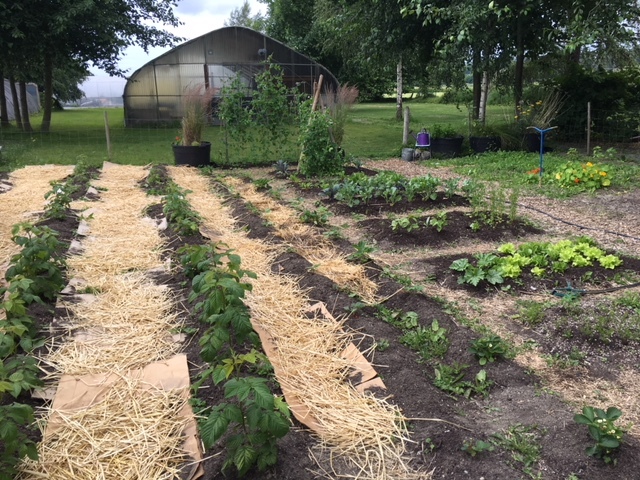 They have new vegetable gardens of peas, broccoli, cucumbers, cabbage, chard, cilantro, basil carrots,beets, and hot peppers. And, for good measure there are rose bushes in abundance. This place is looking good and the hard work is paying dividends. 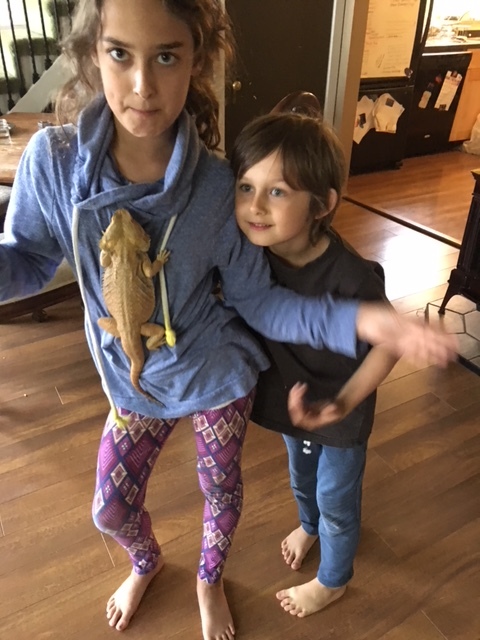 Then, finally, Sienna wants you all to see her bearded dragon lizard. His name is Norman. Lovely creature. Sandy just loves hanging out with Norman. And, Sebastian just loves getting his picture taken. So, he jumped into the picture frame just as I clicked. 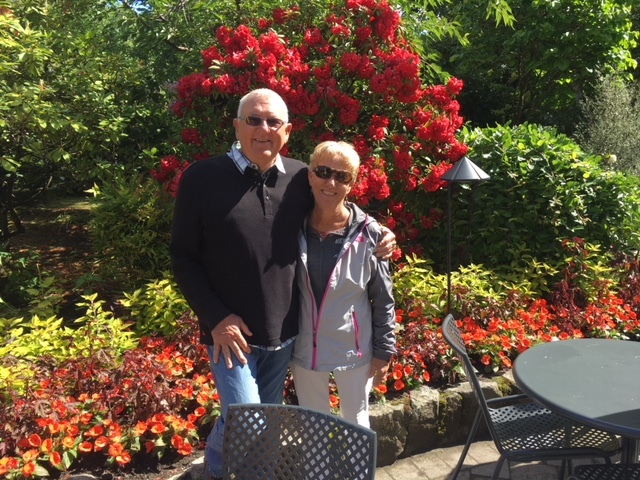 Our friends, Gerry and Sue, arrived in Seattle Friday afternoon. We had planned to stay in Seattle two nights. When Sandy found the hotel room rates were $200-$300 per room per night she decided to search for a 2 bedroom, 2 bath condo via AirBnb. We found an awesome place in Kent, Washington,15 minutes from the airport at less than half the hotel rate. 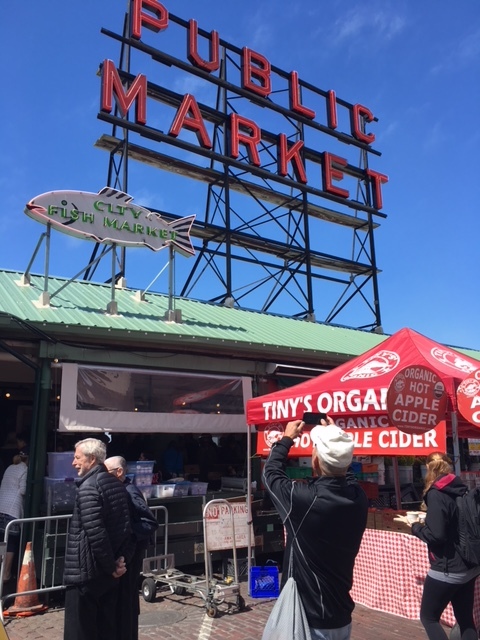 We saved more than $300 per couple on our weekend in Seattle. Thanks to thrifty Sandy. All day Saturday we were Seattle tourist, first, visiting a new Starbucks Museum on Capital Hill. This massive open space was unlike an coffee house we have ever seen. They offered coffee tastings, coffee brewed from huge batches of beans, and pastries. They were delightful. We took the monorail to see the Space Needle but the wait to get in was too long. So, we wandered over to the Music Museum. It was an expensive dud. Don’t do it! We visited Pikes Market. 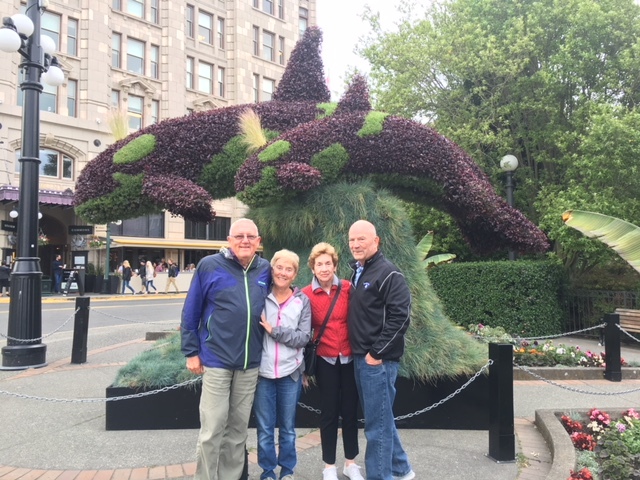 Then, we took an Uber ride to Pioneer Square– drove by SafeCo Field where the Mariners play, and CenturyLink Field, home of the SeaHawks and Saunders. We finished the morning with a nice lunch in some Irish Bar. Then, we started singing Army marching songs to motivate us as we hiked uphill for more than a mile to the car. 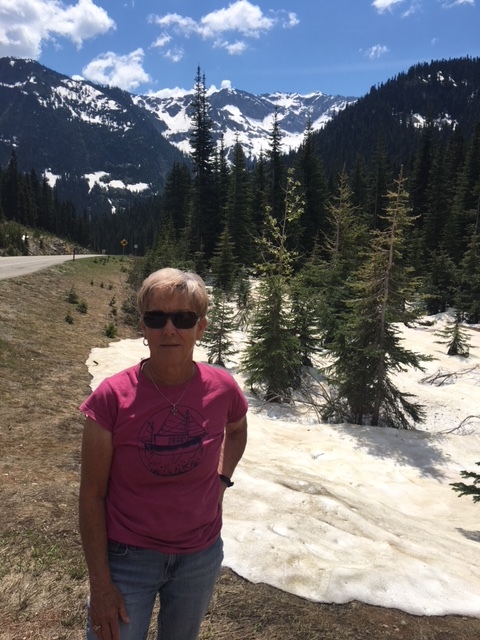 All in all, with Sandy’s encouragement, we hiked 4.6 miles up and down the Seattle streets until Gerry, Sue and I cried uncle. We were ready for a nap before dinner in Kent. Sunday, after Mass we headed north. We dropped by to see Kerry, Sienna and Sebastian and to pick up a dozen fresh eggs that the hens laid that day. Then, we drove on to Anacortes to do some food shopping before loading on to another Ferry to get to Guemes Island. Brian and Amaya came over for a short visit Sunday night. Monday, we spent all day exploring Guemes and just chilling until dinner at Anthony’s. That meal was another fun travel story. Kelly and Rumi came to join our table for six. We ordered our food and were having an enjoyable conversation over drinks and appetizers. We waited more than an hour for the main course before Sue asked Gerry to order a glass of wine. He misunderstood her request and got up to ask the waitress to check on our food order. A few minutes later the manager came by to inquire about our complaint. Dinner was served, followed by desert. Then a BIG surprise came next. All six dinners were on the house, FREE! So we had a great memorable evening and the debate was on as to who was most responsible for getting the meals comped…..was it Sue orwas it Gerry? Or, was it Kelly and Rumi? FREE dinner at Anthony’s WOW! The next morning we drove up through Blaine to Surrey, Canada to catch a huge car Ferry out of Tswassen. An hour and half later we were in Victoria, CA. After a 30 minute cab ride we were in our new AirBnb on Princess Street, 1.7 miles from downtown Victoria. Tuesday night the four of us walked for a while to find a restaurant with a bay view. Gerry enjoyed watching sea planes lift off and land and he kept an eye on the bay throughout our meal. The evening ended with a game of cards, one of many. 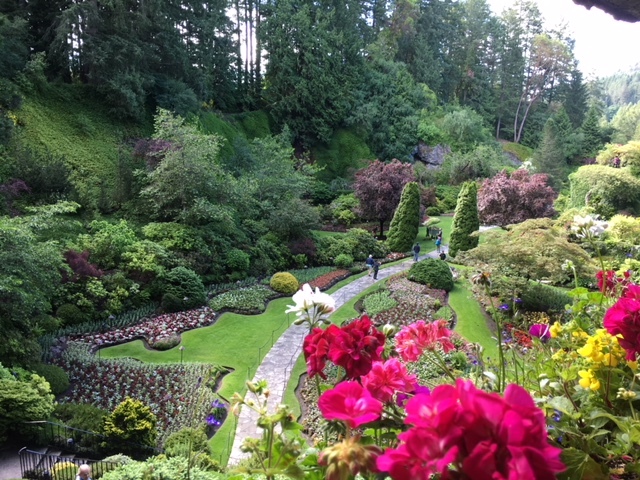 Wednesday, we spent the morning and lunch a Butchart Gardens. These spectacular botanical gardens were started by Jeanie Butchart in 1904. The most magnificent thing you will see is how the gardeners have transformed a rock quarry into natures paradise. It can’t be captured by pictures, but I tried. I completed the week with a once in a lifetime opportunity to become a member of the Guemes Island Country Club participating in the Annual Tide Goes Out Tournament. What a hoot!